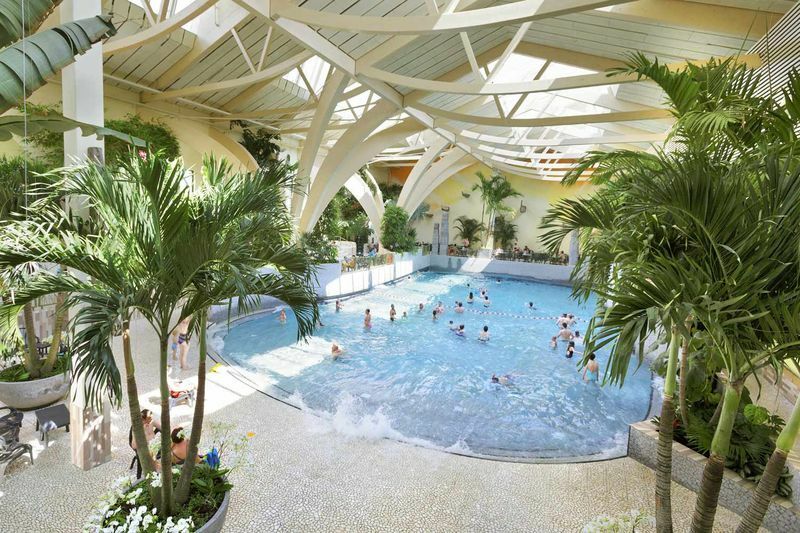 Aqua Mundo is part of the Center Parks property at Bostalsee lake and as a 4,000 square metres tropical-style swimming pool offers fun and excitement for all the family. There are three different slides of up to 143 metres length, a swimming pool with artificial waves, a huge "water playhouse“ with slides, water pistols, climbing ropes, waterfalls and fountains plus an outdoor pool with a lawn for sunbathing and a children’s pool with an integrated sandpit. More? Yes: whirlpools and a café. In a nutshell: No matter the weather, Aqua Mundo will keep your family entertained. Thrill seeker? Then try the water slides, including spectacular rides on tyres and with light effects or speedy runs on a slide that features a fast lane. Children will love the "water playhouse“ with its many water falls, slides – and a water wheel, showering everyone with 140 litres of water. After shooting down slides and having fun in the pool with artificial waves, head to the whirlpools and Aqua Café to relax and unwind.